While Iran has swiftly moved to comply with the terms of the Joint Comprehensive Plan of Action, the multilateral nuclear accord struck in July, hardliners in both Iran and the U.S. have already succeeded in provoking actions that threaten to poison the atmosphere for the deal’s implementation. 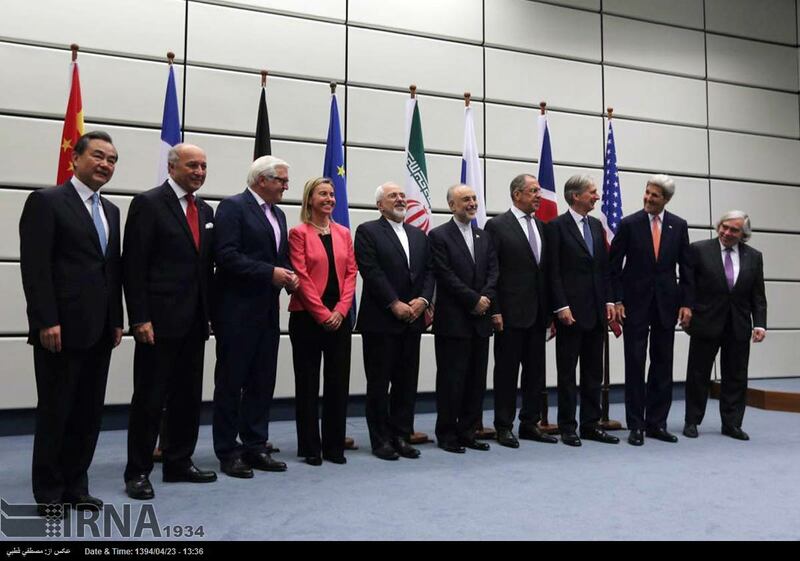 World leaders involved in Iran nuclear talks pose for group photo, July 14, 2015. As the agreement enters a sensitive phase, President Obama and his Iranian counterpart Hassan Rouhani will have to conduct a careful balancing act. In satiating hardline Congressional calls for more aggressive action toward Iran outside the nuclear sphere, President Obama risks triggering aggressive action from Iranian hardliners. If he ignores them, however, he risks ceding control to Congress entirely, which could doom implementation. The same dynamic is true in Iran as Rouhani contends with his own opponents. Two recent issues demonstrate the tricky path ahead. First, Iran conducted a ballistic missile test during its own internal review of the JCPOA, on October 10, while a second test is alleged to have occurred in November. While Iranian ballistic missile testing is not a violation of the JCPOA itself, which focuses squarely on Iran’s nuclear program, it does violate UN Security Council Resolution 1929. Iran views such restrictions as illegitimate limits on conventional weaponry and has ignored them for years. The recent testing has widely been considered a message - both internal and external - that Iran remains a capable adversary despite its moves to roll back its nuclear program. Yet, while the testing could have played well to domestic audiences in Iran, the U.S. could not sit idly by while Iran thumped its chest. Congressional opponents and moderate supporters of the JCPOA viewed the missile launch as a key test for the Obama administration. If the U.S. ignored it, the logic goes, surely Iran would take advantage of American passivity and routinely violate the agreement. While Republicans called for a halt to sanctions relief, twenty-one Democratic Senators urged unilateral action - enough to pose a veto-proof threat if the administration stood pat and viable legislation emerged. Rather than risk an erosion of Congressional support and cede control of the process, the Obama administration was forced to act, signaling that it will roll out nearly a dozen sanctions designations for entities allegedly tied to Iran’s ballistic missile program. Coming just weeks before the possible lifting of sanctions under the JCPOA, and approximately two months before critical elections to the Iranian parliament and Assembly of Experts, the timing is less than ideal. While many Democrats in Congress may be satisfied by the designations, Rouhani has been swift to respond by urging the acceleration of its missile program. The second controversy arose this month when Congress passed discriminatory changes to the visa waiver program that bar Iranian dual nationals or individuals who have traveled to Iran since March 2011 from visa-free travel to the United States. While ostensibly intended as a security precaution in wake of recent terror attacks in Paris and San Bernardino, albeit a poorly targeted one, the issue has ramifications for JCPOA implementation. Under paragraph 29 of the JCPOA, all parties to the agreement must “refrain from any policy specifically intended to directly and adversely affect the normalisation of trade and economic relations with Iran.” As many European business executives traveling to Iran to explore permissible trade under the JCPOA could be affected, the Iranians have argued that the changes are a JCPOA violation. These objections prompted reassurances from Secretary Kerry that the U.S. will not do anything to interfere with economic relief under the accord, pointing to a waiver included in the legislation. Predictably, this provoked howls of outrage from Republicans in Congress. There is a real danger that these attacks at the margins of the agreement spiral out of control. Right now, Iranian hardliners can point to new missile sanctions and visa waiver restrictions as evidence of America’s bad faith. Similarly, Congressional opponents can point to ballistic missile launches and internal repression to justify their view that Iran has been empowered by the accord, although no relief has been delivered. Some of this will be ameliorated by the successful implementation of the JCPOA, but the challenges will not go away. Hardliners in each country will have numerous opportunities to undermine the accord. Presidents Obama and Rouhani will have to be vigilant to head off these dangers, lest the accord die by a thousand cuts. About the author: Ryan Costello is a policy fellow at the National Iranian American Council (NIAC). This piece originally appeared at Huffington Post.